Pendimethalin(PM) is a dinitroaniline herbicide, commonly used for the pre-emergence control of seedling grass and broad-leaved weeds in several broad-leaved crops and in corn, sugar cane and spring wheat. The primary mode of action of all herbicides from this group is by inhibition of cell mitosis that represses development of roots and shoots. PM selectivity is based on avoiding contact between the herbicide and the roots of the desired plants. As all dinitroaniline herbicides, it is highly volatile and undergoes some local leaching in soil. This herbicide is widely used in the world. In 1992, approximately 9000 tons of pendimethalin were used for agricultural purposes in the US, most of them(approximately 60%) in soybean fields. In most of Illinois and Indiana, more than 4 kg of active ingredient(a.i.) km-2 were applied in 1992. Pendimethalin was registered in 1972 for preemergent and postemergent control of broadleaf and grassy weeds on many crops, including: cotton, corn, sorghum, peanuts, rice, beans, peas, wheat, potatoes, soybeans, sunflowers, tobacco, ornamentals, non-bearing fruit and nut crops and vineyards. A systemic dinitroaniline herbicide, like oryzalin and trifluralin, the chemical inhibits germination and seedling development. Available as a granular or an emulsifiable concentrate, American Cyanamid trade names include: Prowl™, Stomp™, Herbadox™, and Pay-off™. Pendimethalin appears as an orange-yellow crystalline solid with a faint nutty or fruit-like odor[4, 5]. Products containing pendimethalin range from slightly to highly flammable. They should not be stored, used or handled near heat or open flames. It is slowly decomposed by light. It is stable under normal temperatures and pressures, but it may pose a slight fire hazard if exposed to heat or flame. It poses a fire and explosion hazard in the presence of strong oxidizers. Thermal decomposition of pendimethalin will release toxic oxides of nitrogen and carbon. Pendimethalin is strongly adsorbed by most soils, and its sorption is correlated to organic matter and clay content. Since it is practically insoluble in water, it will not leach appreciably in most soils and it is considered to present a minimal risk of groundwater contamination[6, 7]. Pendimethalin is strongly adsorbed by most soils, and its sorption is correlated to organic matter and clay content. Since it is practically insoluble in water, it will not leach appreciably in most soils and it is considered to present a minimal risk of groundwater contamination[6, 7]. Pendimethalin is a selective herbicide used for controlling most annual grasses and certain broadleaf weeds in field corn, potatoes, rice, cotton, soybeans, tobacco, peanuts and sunflowers. It is used both pre-emergence, that is before weed seeds have sprouted, and early post-emergence. Incorporated into the soil by cultivation or irrigation is recommended within 7 days following application. Pendimethalin is available as emulsifiable concentrate, wettable powder or dispersible granule formulations[5, 8]. It is a dinitroaniline herbicide that inhibits the steps in plant cell division responsible for chromosome separation and cell wall formation. It is used before crop emergence or planting. It inhibits the development of roots and shoots in seedlings and is not translocated in plants[10, 11]. Pendimethalin is similar to other broad-spectrum herbicides in that it is phytotoxic to crop species to some extent. In the development of herbicides, screening experiments are conducted to ascertain extent of phytotoxicity to crops. The phytotoxicity of pendimethalin to crop species has been the focus in numerous experiments, for example, rice grain, and strawyield, root suppression of pampas grass, injury to seashore paspalum cultivars used for turf grass[14, 15], effect of repeated application on cotton yield and quality, cotton fiber quality and yield, and toxicity to selected springand summer-flowering bulbs and perennials. Pendimethalin is not highly acutely toxic to animals. Interestingly, it is many times more acutely toxic by inhalation, LD50 = 320 mg/l, than by the oral or dermal routes, oral LD50 = 1250 mg/kg.2. In a chronic study, dogs ingesting 50 mg/kg or higher, developed liver damage, with increased liver weights. Tested rats developed similar effects. Pendimethalin causes central nervous system depression in mice and rats. In addition, the herbicide potentiates hypnosis caused by other drugs such as pentobarbitone, barbitone or ether, and lengthened recovery from drug effects. The pesticide is highly toxic to fish and aquatic invertebrates, LD50=0.138-280 ppm. As a result, pendimethalin labels bear the following warning: This pesticide is toxic to fish and aquatic organisms. Fish may be killed at application rates recommended on the label. Pendimethalin causes thyroid follicular cell adenomas in male and female rats, and is classified as a possible human carcinogen(Group C) and is also a suspected endocrine disruptor. While no developmental effects were reported in the RED at the doses administered orally to rats and rabbits, maternal toxicity was observed at the highest doses tested(125, 250, 500 mg/kg/day) in rabbits, evidenced by increased mortality. Reproductive effects were found in rats at the highest dose tested[5000 ppm], based on pup body weight gain and possible decreased pups born alive and pup survival. Also, the percentage of apoptosis increased in mouse embryos exposed to low doses of pendimethalin, suggesting that at levels considered to be safe in humans pendimethalin has adverse effects very early in development. Dietary exposure to pendimethalin and the cancer risk to the general population are low. Exposures to applicators, either commercial or residential, and occupational handlers are higher than for the general population, and are at a level of risk that is of concern. Pesticide applicators exposed to pendimethalin showed an exposure response for lung cancer. A later study found no clear association of lifetime pendimethalin exposure with cancer incidence, but observed evidence of an elevated risk of lung cancer at the highest levels of exposure and an increased risk of rectal cancer in pendimethalin-exposed pesticide applicators compared to non-pendimethalin-exposed applicators. The widespread use of this herbicide has led to its detection as contaminant in surface water, air and precipitation by the U. S. Geological Survey’s National Water Quality Assessment(NAWQA) program[24, 25]. Mu¨ ller et al. (2002) studied off-target movement of several pesticides by runoff. They reported that dissolved herbicides accounted for more than 99.5% of the total loss for most compounds tested at all rainfall intensities(acetochlor, atrazine, hexazinone and terbuthylazine), and the concentrations of the herbicides decreased with rainfall intensity. Pendimethalin behaved differently: 35% of the loss was estimated to be associated with sediment transport and variations in the pendimethalin concentrations were small(from 12 to 20 mg l-1) compared to variations detected over the same time period for other herbicides. There was no apparent temporal trend in dissolved pendimethalin concentrations for all treatments. This behavior is ascribed to the very low solubility and the relatively strong binding of pendimethalin to soil components, such as clays and organic matter. Pendimethalin adsorbs strongly to soil organic matter and clay and does not leach through the soil to contaminate groundwater[4, 5, 27]. Pendimethalin is not subject to microbial degradation. Slight losses of pendimethalin can result from photodecomposition and volatilization. When used according to label instructions, no carry over to subsequent crops is expected. Anderson, W.P., 1996. Dinitroaniline herbicides. Weed Science: Principles and Applications, 3rd edn. West Publishing, St. Paul, MN, pp. 184–187. USGS National Water Quality Assessment Program: annual use maps, 1998. Available at: http://ca.water.usgs.gov/pnsp/use92/ index.html [Online]. Occupational Health Services, Inc. 1991[Feb. 21]. MSDS for Pendimethalin. OHS Inc., Secaucus, NJ. U.S. Department of Agriculture, Soil Conservation Service. 1990[Nov.]. SCS/ARS/CES Pesticide Properties Database: Version 2.0[Summary]. USDA - Soil Conservation Service, Syracuse, NY. Wauchope, R.D., Buttler, T.M., Hornsby, A.G., Augustijn Beckers, P.W.M., Burt, J.P., 1992. SCS/ARS/CES Pesticide properties database for environmental decision making. Rev. Environ. Contam. Toxicol. 123, 1– 157. Weed Science Society of America, 1994. Herbicide Handbook, Seventh edition. Weed Science Society of America, Champaign, IL. Meister, R.T.[ed.]. 1992. Farm Chemicals Handbook '92. Meister Publishing Company, Willoughby, OH. Richardson, M.L., Gangolli, S.E.,[Eds. ], 1994. The Dictionary of Substances and Their Effects., Vol. 6. The Royal Society of Chemistry, Clays Ltd., Cambridge, UK, pp. 431–432. Appleby, J.R., Valverde, B.E., 1988. Behavior of dinitroaniline herbicides in plants. Weed Technol. 3, 198–206. Gilliam, C.H., Eakes, D.J., Olive, J.W., 1993. Herbicide use during propagation affects root initiation and development. J. Environ. Hort. 11, 157–159. Devi, L.S., Gowda, R.S.D.B., 1985. Studies on efficacy of pendimethalin: 2. Pesticides 19, 41–43. Green, J.C., Keever, G.J., Gilliam, C.H., Palmer, C.K., Olive, J.W., Eakes, D.J., 1997. Effects of preemergence-applied herbicides on pampas grass grown in containers. J. Environ. Hort. 15, 77–80. Johnson, B.J., Duncan, R.R., 1998a. Tolerance of seashore paspalum cultivars to preemergence herbicides. J. Environ. Hort. 16, 76–78. Johnson, B.J., Duncan, R.R., 1998b. Influence of herbicides on establishment of eight seashore paspalum cultivars. J. Environ. Hort. 16, 79–81. Keeling, J.W., Abernathy, J.R., 1989. Response of cotton[Gossypium hirsutum] to repeated applications of dinitroaniline herbicides. Weed Technol. 3, 527–530. Keeling, J.W., Dotray Peter, A., Abernathy John, R., 1996. Effects of repeated applications of trifluralin and pendimethalin on cotton[Gossypium hirsutum]. Weed Technol. 10, 295–298. Skroch, W.A., Catanzaro, C.J., De Hertogh, A.A., Gallitano, L.B., 1994. Preemergence herbicide evaluations on selected spring and summer flowering bulbs and perennials. J. Environ. Hort. 12, 80–82. Garg, S.K., et al. 1987. Neurotoxic effects of pendimethalin - a weedicide. Indian J. Exper. Biol. 25:463-6. Hurley, P.M., R.N. Hill, & R.J. Whiting. 1998. Mode of Carcinogenic Action of Pesticides Inducing Thyroid Follicular Cell Tumors in Rodents. Envrionmental Health Perspectives 106(8]:437-45. Greenlee, A.R., T.M. Ellis, & R.L. Berg. 2004. Low-dose agrochemicals and lawn-care pesticides induce developmental toxicity in murine preimplantation embryos. Environmental Health Perspectives 112(6]:703-9. Alavanja, M.C., et al. 2004. Pesticides and lung cancer risk in the agricultural health study cohort. American Journal of Epidemiology 160(9]:876-85. Hou, L., et al. 2006. Pendimethalin exposure and cancer incidence among pesticide applicators. Epidemiology 17(3]:302-7. Capel, P.D., Lin, M., Wotzka, P.J., 1998. Wet Atmospheric Deposition of Pesticides in Minnesota, 1989–1994. U.S. Geological Survey, Mounds View, MN. Larson, S.J., Gilliom, R.J., Capel, P.D., 1999. Pesticides in streams of the United States—initial results from the National Water-Quality Assessment Program U.S. Geological Survey Water-Resources Investigations Report 98-4222, 92 pp. Sacramento, CA. Mqller, K., Trolove, M., James, T.K., Rahman, A., 2002. Herbicide runoff studies in an arable soil under simulated rainfall. N. Z. Plant Prot. 55, 172– 176. 1985[March 31]. Chemical Fact Sheet For: Pendimethalin[Fact Sheet No. 50]. Office of Pesticide Programs, US EPA, Washington, DC. Yellow-orange crystalline solid. Mild nut-like odor. Commercial product is available as an emulsifiable concentrate. Herbicide used to control the spread of weedgrass. 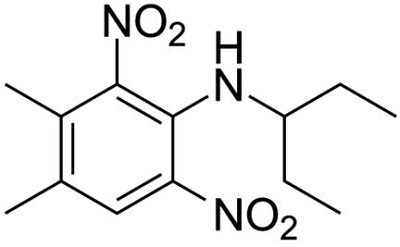 ChEBI: A member of the class of substituted anilines that is N-(pentan-3-yl)aniline bearing two additional nitro substituents at positions 2 and 6 as well as two methyl substituents at positions 3 and 4. A herbicide used to control most annual rasses and many annual broad-leaved weeds. used to control many annual grasses and broad-leaved weeds in crops such as corn, cotton, peanuts, potatoes, rice, sorghum, sunflower and tobacco. Herbicide: Pendimethalin is a selective pre-emergence and post-emergence herbicide used on various agricultural and non-agricultural sites to control broadleaf weeds and grassy weeds in crops such as apricot, carrot, cherry, corn, cotton, fig, garbanzos, garlic, olive, onion, nectarine, peach, pear, pecan, plum, rice and prune, and noncrop areas. It is applied to soil preplant, pre-emergence, and post-emergence with ground and aerial equipment. Pendimethalin is a selective preemergence and postemergence 2,6-dinitroaniline herbicide used on various agricultural and non-agricultural sites to control broadleaf weeds and grassy weeds in crops such as apricot, carrot, cherry, corn, cotton, fig, garbanzos, garlic, olive, onion, nectarine, peach, pear, pecan, plum, rice and prune, and noncrop areas. It is applied to soil preplant, pre-emergence, and postemergence with ground and aerial equipment. Kole et al. (1994) studied the degradation of pendimethalin by an unadapted strain of Azotobacter chroococcum Beijerinck in pure culture condition. Degradation was rapid — 45 and 55% of the parent compound was degraded after 10 and 20 days, respectively. The reported half-lives of pendimethalin in a Sharkey clay soil and Bosket silt loam are 6 and 4 days, respectively (Savage and Jordan, 1980). Irradiation of pendimethalin in methanol yields, in addition to the minor dealkylated product, the major products 2-amino-6-nitro-N-(1-ethylpropyl)-3,4-xylidine and 2-nitroso-6-nitro-3,4-xylidine. Pendimethalin degrades rapidly through reductive cyclization of the amino group and adjacent N-ethylpropyl to give a cyclized benzimidazole product. The photodecomposition of pendimethalin involves oxidative dealkylation, nitro reduction, and cyclization. By soil bacteria, pendimethalin degrades through different pathways from the photodegradation reaction, resulting in benzimidazole and hydroxylated products of the N-alkyl and xylyl methyl groups. The major metabolic routes of pendimethalin by rats involves hydroxylation of the 4-methyl and the N-ethyl group, oxidation of these alkyl groups to carboxylic acids, nitro reduction, cyclization, and conjugation in the urine and the tissues. Products of cyclization reactions giving methylbenzimidazole-carboxylic acids are unique metabolites to the liver and kidney. Reacts with oxidizers, acids and alkaline materials. Contact with strong oxidizers may cause fire and explosions. It is the responsibility of chemical waste generators to determine if a discarded chemical is classified as a hazardous waste. See 40 CFR Parts 261.3 for United States Environmental Protection Agency guidelines for the classification determination. Additionally, in order to ensure complete and accurate classification, waste generators must consult state and local hazardous waste regulations. Organic pesticides, whether of botanical or synthetic origin, can be destroyed by incineration equipped with scrubbers to remove acid wastes. 40487-42-1 US $1.00 / kg 1 kg/桶 99% 20tons Hebei Jimi Trading Co., Ltd.
40487-42-1 US $10.00 / KG 10KG 99% 1000 ton / month Hebei Chisure Biotechnology Co., Ltd.